This may be more of an acoustical physics question, but is there something fundamental about wave harmonics that also inhere geometric symmetries like a 3:4:5 triangle? The image shows a somewhat modified Tonnetz schema (rotated counter-clockwise to staff orientation) whereby each pitch class & key gets its own domain. 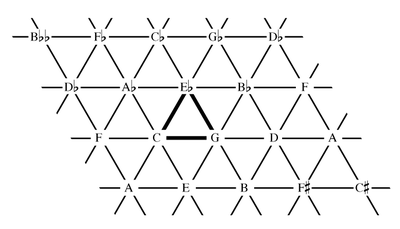 Like the more standard Tonnetze, this tone net establishes a matrix of the triads, based on the classical consonances of Maj & minor thirds & the Dominant fifths. However its structure is based on the intersection of pitch classes (here the Y axis) and diatonic keys (the X axis). Is this a known property, that there are right triangles in triadic structures of wave harmonics? Or, in any propagation medium, wouldn't similar relationships between ablative (dissonant) & harmonic (consonant) waveforms arise, perhaps not only in acoustics? The 3-4-5 ratio arises from the ratio of the sides. Putting the harmonic intervals 3 - 4 - 7 on an x-y coordinate graph yields a ratio of 3:4:5. That is, the calculated lengths of the x-y segments on the coordinate graph yield a 3:4:5 triangle, irrespective of the named intervals. The actual spatial offsets of the minor 3rd is larger than 3, the Maj 3rd is > 4, and the 7 semitones of the dominant greater than 7. Please see calculation citations at bottom. The "scale phase" is the regular, descending pattern of scale notes (the grayed tone boxes) that form successive keys (downward, going left-to-right). Note it interlocks periodically with the leading-tone/sub-dominant chain. Rotated 45 degr. clockwise & this schema resembles the Balzano 3rds space. we see that these triads are not right triangles, but rather equilateral triangles. 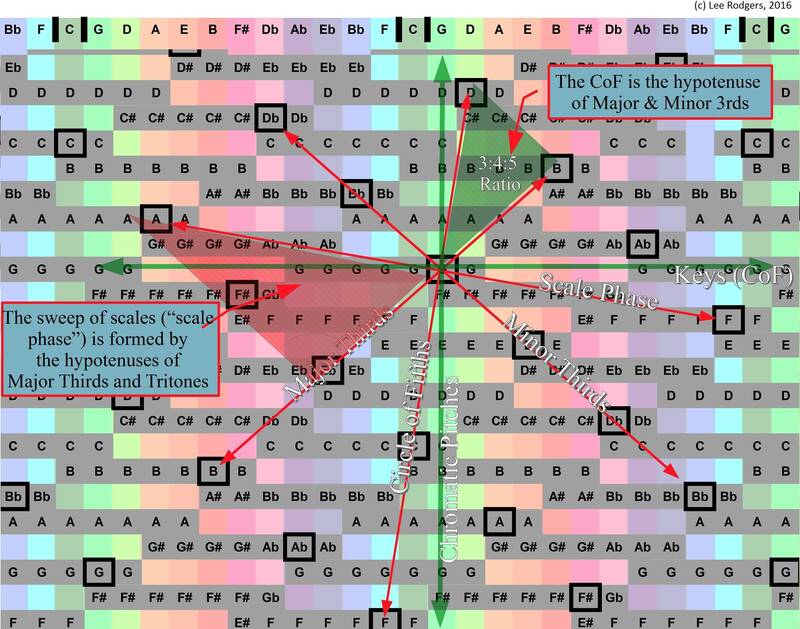 So although there are symmetries related to diatonic harmony (and diatonic scales, etc.) ---and they are interesting and worth discussing!---the symmetries you are showing and asking about are really just a byproduct of how you've chosen to lay out your Tonnetz. With that in mind, note that the consonant triads---major and minor---are both constructed with one minor third and one major third. (The major triad has the major third on bottom with the minor third on top, and the minor triad inverts this.) Furthermore, the remaining interval can be viewed as a perfect fourth. The minor third is 3 semitones, the major third is 4, and the perfect fourth is 5. So, assuming you lay out your geometrical space correctly, it's quite easy to walk away with a 3:4:5 right triangle. Is this a known property, that there are right triangles in triadic structures of wave harmonics? No. What I'm basing this on is in your use of (right) triangles and the idea of the hypotenuse, which implies quantities that add in quadrature ala the Pythagorean theorem. Our sense of tone is intimately tied to the sounds that are (good approximations of) comprised of a overtone series that are integer multiples of a fundamental, and our sense of harmony only relates to these kinds of sounds. There is no adding in quadrature here, thus no triangles. Not the answer you're looking for? Browse other questions tagged theory chord-theory tonnetz or ask your own question. Why do harmonics sound good? Are there any small electronic musical instruments which would be useful for learning music theory? Where do I get answers to my musical “Why” questions, i.e. are there any “Why” books out there?